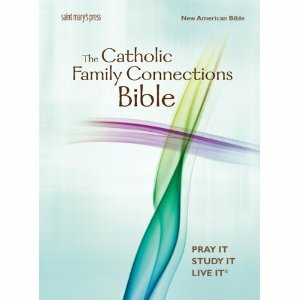 From Saint Mary's Press, who publishes the Catholic Youth Bible, comes the Catholic Family Connections Bible. Utilizing the current NAB translation, this Bible: "Helps families connect to each other through family faith conversations, helps families connect to Faith through practices of prayer and devotion, and helps families connect to the community through participating in Christian service together." I received an email this morning from Amazon.com stating that this Bible was now available, however, the Saint Mary's Press website says that it will be released in June. In either case, there seems to be a push from Catholic Bible publishers to produce more attractive "family" editions of the Bible, perhaps as opposed to those large heirloom Bibles that too few people actually use. * Over 700 lively articles help you Pray It! Study It! Live It!?? If we are happy with your price, then we will send you the Link details that you can place on your website and we will make the payments to the PayPal id provided by you.